Our ion selective electrodes are highly stable, ac­cu­rate­ly measuring cal­ci­um, po­tas­si­um, hydrogen and TPP ion activity. Tips consist of 2 mm di­am­e­ter plas­tic tubes sealed at one end with an ion-sen­si­tive mem­brane. After filling the ion selective electrodes with elec­tro­lyte so­lu­tion, you can in­sert the tube into the hold­er and con­nect it to a pH meter. Tips and hold­ers are in­ter­change­able, so one tip may be re­placed with an­oth­er sensitive to a dif­fer­ent ion. Replac­ing a tip takes less than a minute. Elec­trode tips nor­mal­ly last sev­er­al months, when stored proper­ly in sa­line so­lu­tion. When re­place­ment is neces­sary, only the tip needs be re­placed. 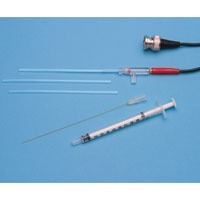 Kwik-Tip electrodes are available separately and as kits. A separate ref­er­ence electrode, such as WPI’s Dri-Ref™, is also required.